At last, after many rounds of correspondence by email, Hugo and I had a chance to meet at Anderson & Sheppard last week. 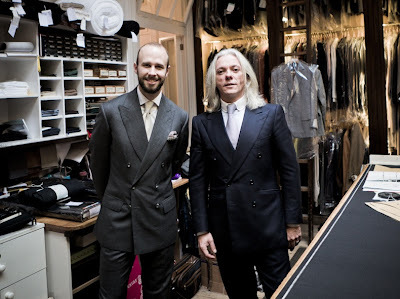 Hugo was over in London for a couple of days, touring the Savile Row houses for the purposes of his own excellent blog Parisian Gentleman. Contrary to appearances, Hugo and I are not preparing to engage in a passionate embrace. 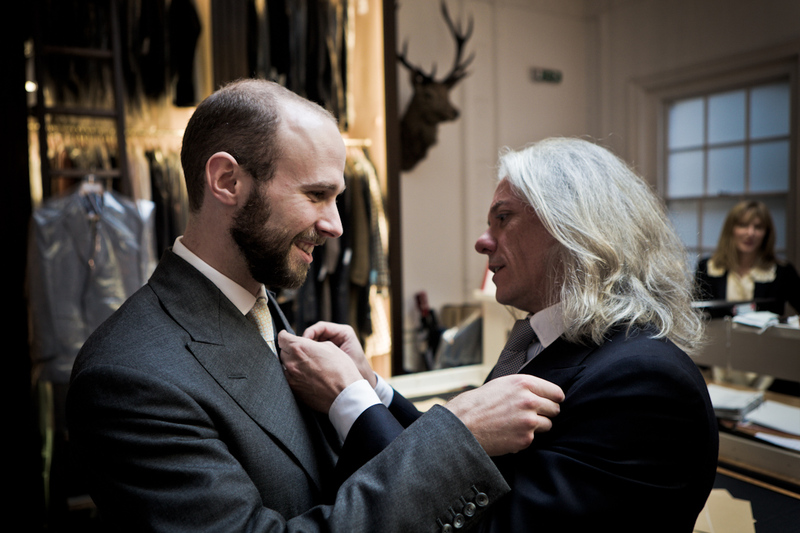 We are merely inspecting the make of our two suits – his from Cifonelli and mine Anderson & Sheppard. Indeed, he was wearing Corthay and myself Cleverley shoes: it was full Anglo-French warfare. Good to see you Hugo, and we look forward to reading about your adventures on the blog. You can follow the discussion on Welcome Hugo Jacomet, Parisian gentleman by entering your email address in the box below. You will then receive an email every time a new comment is added. These will also contain a link to a page where you can stop the alerts, and remove all of your related data from the site. I’d to underline that the Cifonelli’s cut is truly more elegant than A&S’s one. FYI, Cifonelli is French not Italian. Well, originally Italian and in both countries for quite a while. Style wise, I’d say it’s a nice mix. Give me the A&S shoulders and silhouette any day.